This has been a great week of celebrations – and reflection for me. 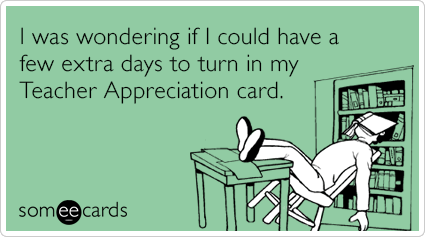 Teacher Appreciation Week. Nurses’ Week. Mother’s Day. Three jobs I have held. Three jobs I have loved. I have to admit I wasn’t always on the Teacher Appreciation bandwagon. I thought having summers off should make up for any minor annoyances a teacher might have to endure during the course of the school year. Then I became a teacher – first at the college level, then at the public school level. My eyes were opened. If I calculated all the unpaid hours I put in grading papers, designing websites, trying to create interesting lesson plans, looking for free resources…I would probably be making minimum wage. There is not enough funds to buy all the things my classroom needs – I buy things out of my pocket. I have students who are fixated by social media, drama and the myriad of daily minor/major catastrophes that make up high school. My analogies are that it is like herding cats or nailing jello to a tree. But I have students who have a tremendous desire to not only succeed, but to excel. My heart is alternately filled with joy, and burdened with sadness for these beautiful young people. Sometimes when I am trying to corral them all at the hospital or keep them awake during a lecture by a guest speaker, I think – yes, this is hard work. Yes, this can be thankless work. But yes, this is MY work. I haven’t always been a nurse, either. The profession has changed profoundly over the last few decades. Unsafe staffing ratios, long shifts and endless paperwork take time away from deserving patients. Your patients are not always at their best – scared, hurting, alone – and there is a fair amount of abuse toward caregivers. I personally have been called fat, old and stupid by a patient because I did not put enough ice in his soft drink. I have been choked, swung at, and even had an elderly gentlemen get me in a headlock with his legs when I tried to put a catheter in. But I have also had patients who came back to see me after their discharge and thank me personally for caring for them, and caring about them. 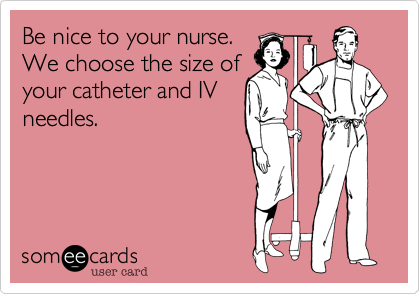 As a nurse you can make a real difference, if only for one shift. You can calm, reassure, comfort and educate. You can encourage, support, and relieve pain. At the end of the day, I still think nursing is a good way to spend a work day. So to my fellow teachers, nurses, and Moms – I hope you enjoy the celebrations. If you aren’t a teacher, nurse or mother…at least this past week you could have celebrated Cinco de Mayo (Monday) National Shrimp Day (Friday) and Liver and Onions Day (Saturday). Somehow, I think my celebrations were better. For all the jobs you do and have done, thankless sometimes certainly; I will tell you thank you. Thank you, Miss Valentine. I hope my post showed how thankful I am to have had these jobs. I’ve been 2 of the 3. Not nursing but I think it’s a great profession. Nice to hear from you! Thank you for all the love you’ve given, and continue to give, to the world. Regardless of the job title, you’ve clearly got caring down to an art form. Being a Mom has taught me you never stop being a Mom. 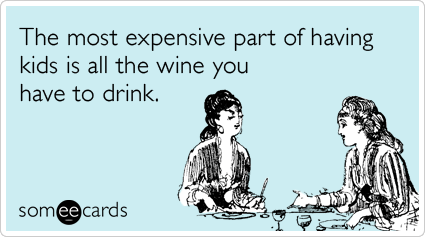 Enjoy the day; drink wine. And you are incredible at all three professions. Hope you had a lovely Mother’s Day! Great post! I especially like the teacher one as my granddaughter is a teacher. And I have so many friends who say “must be nice to get paid for doing nothing in the summer.” Uh hello same pay just spread out over the whole year! Plus the politics involved in teaching are horrid. What happened to just teaching? Well, I got to cash in on the mom celebration and it was a good one. Funny that I got a gift of wine from one and google gift card (to buy things for my tablet) from the other -they know me well. Give her some wine and her technology and she’ll be good for hours! Sounds like it was a great week to be you! I bet you’re a fabulous nurse, Katie. Happy belated mothers, nurse and teacher day. As a HS teacher, I relish revelations from previously skeptical about how hard teachers work persons. Awkward – sorry. Enjoyed your post, glad to see you again and Happy Belated Mom’s Day! Tar – Hi. I always appreciated my kids teachers, but we worked together to educate my kids. We should all have to walk a mile in teachers’ shoes!